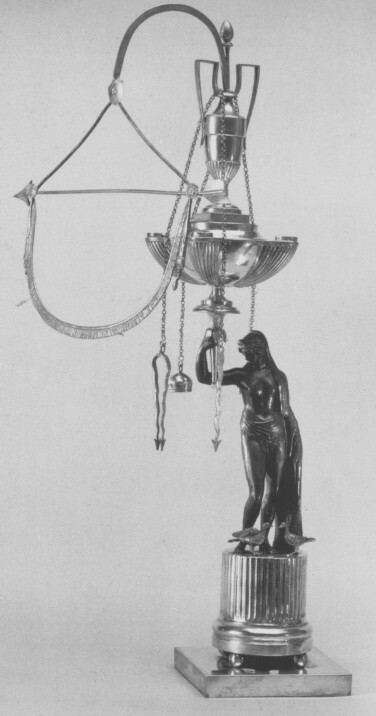 After several centuries in which oil lamps (in Italian: lucerna) was into disuse, they became popular again around the mid 18th century in the form of a silver lamp with a reservoir, applied to a long rod, and supported by a large base (usually wood weighed). This new production of silver oil lamps was restricted to Italy, mostly being produced in Rome and Papal State, and limited quantity being produced in Naples, Milan, Genoa, Venice and Florence. Some examples have Maltese hallmarks, mostly destined for customers in Naples and other cities in Southern Italy. At the beginning of the 19th century, the neo-classical taste resulted in the production of figural oil lamps in which the reservoirs are supported by human figures (mostly in Egyptians clothing), Greek or Roman Divinities (especially Mercury) and, sometimes, animals. Most lamps were provided with a shade and were equiped with snuffers, tweezers and estinguishers hanging from chains applied to the rod. A pecualiarity of some lamps made in Genoa is the glass reservoir. Production of silver oil lamps ceased in the late19th century when more efficient sources of illumination became available, even if a limited production survived in the 20th century exclusively for decorative purposes. 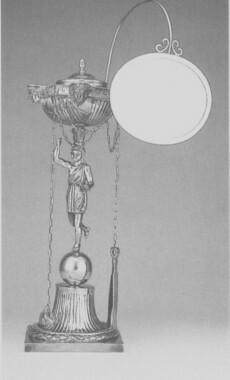 The photos that follow depict some examples of silver oil lamps. Rome 1807/1837, silversmith Vincenzo Bugarini. Four wicks spouts in shape of animal heads. 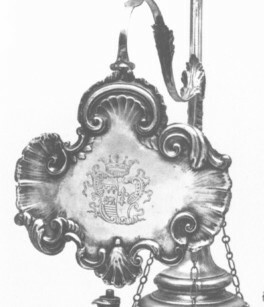 The shade is decorated with the Chigi coat of arms. 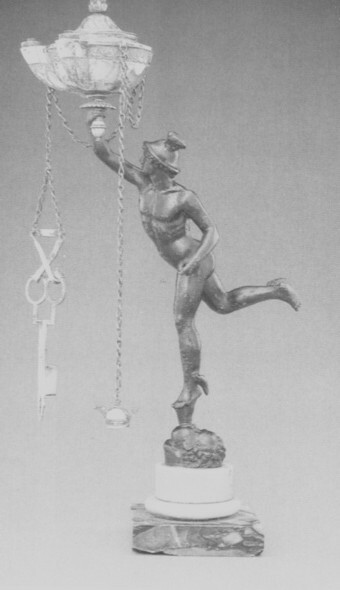 Rome, around 1820, silversmith Vincenzo Parenti, snuffer and shade of other silversmiths. Rome, 1810, silver and bronze. Another example of "retour d'Egypte style"